If you had to choose one thing that you’d like to see changed at your favorite casino, what would it be? An improved rewards program? Perhaps. More games or better payouts? It’s tough to argue against that. At the Resort World Casino in Queens, New York, however, the most important area for improvement is definitely the speed with which they dispense daiquiris to guests. If this complaint sounds obscure, consider the massive 400 person fight that occurred at approximately 10:30pm last Saturday evening. According to police reports, the fight was a byproduct of the debut of a new bar at the popular casino. As lines reached unbelievable lengths, tempers began to flare. Two women in the line allegedly began fighting before dragging their groups of friends and other casino visitors into the altercation. As the brawl escalated, guests began grabbing chairs and poles to use as weapons against the aggressors. While security guards rushed to quell the situation, spectators began recording footage of the violence and posting it to social media. Video showing gangs of fighters shouting profanities and storming the casino hall reached the internet even before the fight’s conclusion. All told, three men were arrested following the fight with charges including disorderly conduct and resisting arrest. Four security guards, as well as a police officer, were injured in the altercation. Several of those involved in the fight were also taken to the hospital to be treated for their injuries. Early estimates put the cost of the damage north of $4,000, but the incident has served as a wake-up call for the casino’s security team. 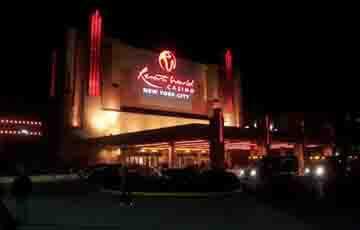 Resorts World has already stated an intention to increase its security forces and work more closely with local police in order to prevent future incidents. Multiple reports indicated that, in addition to the melee, gunshots were fired in the casino’s parking lot around the time of the incident, and the suspect remained at large as of Monday morning. However, using the NYPD’s Facial Recognition Unit and the casino’s surveillance footage, the police were able to identify the shooter. While occasional fights aren’t unheard of at casinos around the world, this one was particularly noteworthy because of its scale. The incident serves as yet another reminder of the importance of remaining alert and aware of your surroundings when testing your luck. While the vast majority of gambling experience will be free from incident, there’s always the possibility of an altercation. If you’d like all the fun of visiting a casino without the possibility of incident, online casinos offer the perfect balance of safety and fun. With all of your favorite games, unbeatable promotions and some of the best customer service in the industry, there’s a reason why online casinos are continuing to grow in popularity in locations around the globe. Try to remember, however, if someone is in the kitchen using the blender, you may need to wait before making yourself a daiquiri. By knowing what to expect, you can resist the urge to throw chairs and ensure that your gaming experience is a positive one!